Ramiro Gomez “Cut-Outs part of Fragments From Home, curated by Chon Noriega is a preview of Home So Different, So Appealing which opens on June 7, 2017 as part of the Getty’s Pacific Standard Time: LA/LA. The Cut-Outs installation piece, an 8 x 73 foot acrylic on cardboard mural, deals with scenes from Gomez’s West Hollywood neighborhood. Gardeners and pool cleaners tend to the outside, then the mural proceeds inside, depicting housekeepers cleaning the living room, dining room, the bathroom and finally, the bedroom. 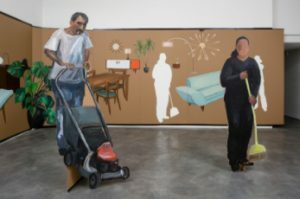 Playing with negative space and with perspective, Gomez has life-sized cardboard figures emerge from the body of the mural, standing alone in the space, confronting the viewer. The piece functions as a still-life of affluent Los Angeles. LA ART SHOW 2017 WILL FEATURE BROADEST INTERNATIONAL PROGRAM TO DATE WITH A FOCUS ON LATIN AMERICAN ART, AND STRONG PRESENTATIONS FROM EUROPE, CHINA, CUBA, JAPAN AND SOUTH KOREA.